Mass protests and demonstrations have always been especially magnetized around faces, with a foundation of ideologically based imagined communities (Welaratna 2010). Examples range from Marianne, the face and figure who guided the French republic through the French revolution, to Che Guevara, whose image rose to prominence in the late 60s as a symbol for youthful protest movements around the world, to the now famous Obama Hope poster by Shepard Fairey that has become a favorite profile picture on social networks like Facebook. The Iranian election protests that began in 2009 and continue today are no exception. Both visual production and network activity around the Iranian election protests reflect the increasing agency of individuals in dictating ideological objectives of their states and molding public perceptions of their states as represented in the media. Here, I talk about the visual imagery of the Iranian Revolution with a particular emphasis on how the death of Neda Agha-Soltan, captured on cellphone videos and distributed via YouTube, became a turning point in the media framing and coverage of the protests in Tehran and around the world. I also discuss the role of new media networks through an examination of Twitter use around the protests and government reactions. The reversal of power – moving agency away from state leaders and into the hands of individuals and the leadership of organized but unofficial movements – signals an important shift in the dynamics of collective action and state power structures and raises many questions about new models of governance and decision-making. On June 13th of 2009, I was in Paris for a summer abroad study program, ostensibly taking a tour of the myriad museums that pepper the renowned city. But that day I was returning again and again to my computer screen, reading about how the growing anger over questionable results for Iran’s presidential election was spilling on to the streets of Tehran in an intense show of skepticism and outrage. Images of burning buses, videos of Mir-Hossein Mousavi supporters running through the streets, and close-ups of politicians with their fingers pointed to emphasize their determination were the bread and butter of reports from CNN, the BBC, and other international outlets. In early days, the focus was placed on the challenger who contended that the results of the election were unfair, Mir-Hossein Mousavi. 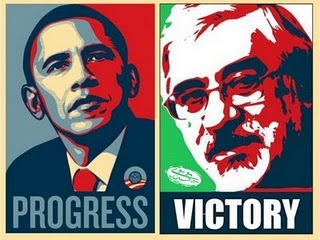 Images of Mousavi were restyled into the format of the Obama Hope poster, among other representations, endowing the subject with change agent status — despite the fact that Mousavi is historically hardly the reformer international supporters seemed to expect (Khalaji 2009). But then an unexpected event occurred, the flash dissemination of a video captured on a cell phone that recalls the Zapruder film Sturken and Cartwright point to as a significant image event (227). A young woman’s death is captured through the sound of shots, and then images of her on the ground, first seeming fine then suddenly and violently streaming blood as her life ebbs away. We hear her name, Neda, being shouted in despair as she dies. Images from the video, as well as the video itself, raced across the Internet through the channels opened by the digital protests engaged in by Iranians as part of the Green Revolution. Early allegations leveled in the event include a sniper attack and an attack by bike-riding gunmen, while the Iranian government contended that it was a set-up. As the video and other images of Soltan began to circulate, global image performance and production activities began to take hold as individuals and groups around the world began using images of Soltan to represent their fears, goals, and inspirations. Soltan’s face began to crop up on posters and profiles both on the streets of Tehran and on social networks like Facebook and Twitter, usually altered and matched up with slogans that supported the Iranian protests. There are four images of Neda Agha-Soltan that recur again and again in digital spaces. Two are from the video, one as she stares up at the camera from the ground, only her face unblocked by people and seemingly unharmed, the second moments later with the same framing, but with her face covered in streams of blood. The two other images are of close-ups of Soltan, one with her head cocked to one side as she smiles widely at the camera, her head uncovered, the second a more formal portrait in which she stares at the camera with a serious expression, wearing a headscarf. These four images appear both in an untreated state as well as in restylings created by various, mostly anonymous, reproducers. 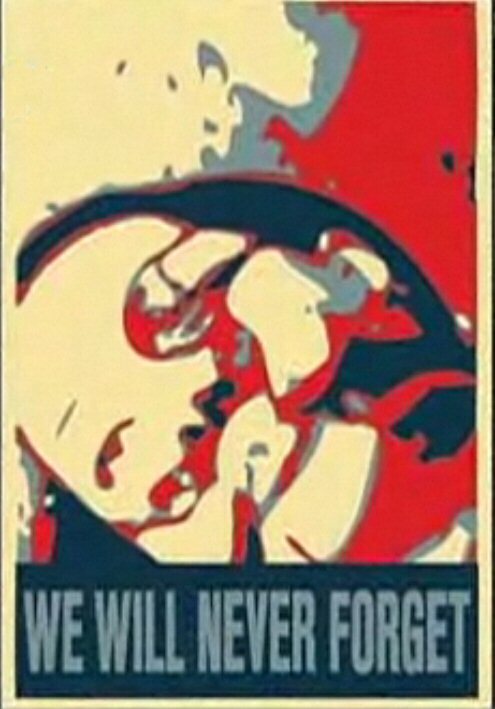 In one “Obamified” image, Soltan’s face is cropped to fill the frame, above the text “we will never forget.” The image acts as both a traditional memorialization of her as well as a more complex evocation of the ideoscapes of hope and change associated with Obama’s campaign and election. The immediate result of the Soltan image event was that Mousavi was eclipsed as a visual focal point for Iranian protestors and international sympathizers. In addition, the media discourse about the revolution became distinctly less political and far more personal, as journalists, pundits, and bloggers debated the specifics of the event, analyzed the few brief frames of the video, and delved into Soltan’s background and motivations. In the Western media, the discourse retreated almost completely from the ruling leaders’ and Mousavi’s policies and focused squarely on personalizing the Iranians on the ground in the protests. But even more importantly, the protests began to be framed in terms of gender equality as a key tenet, as exemplified in an article published on June 22, titled “Women At Forefront Of Iranian Protests,” linking Neda’s status as an icon to the push for more rights for women that played a prominent role in the election campaigns (Esfandiari 2009). The ideals of protest and revolution, first made “cool” in the West through the dissemination of the Guevara image, were instantly memorialized in the Iranian protests, crystallized into a violent image of persecution and martyrdom and creating an emotional focus for the revolution in vulnerability and strength. The extent to which this is true can be seen by image production like the one below, in which Soltan’s face has been inserted into the silhouette of Che Guevara. As Lisa Nakamura points out in a blog post on Difference Engines, Soltan’s popularity in the media can also be linked to a tradition of privileging images of light-skinned women who fit into traditionally Western standards of beauty. While there are no other precedents to confirm this bias in the Iranian protests, it is worth mentioning in the context of how little media coverage and popular interest there had been in the contemporaneous Honduran revolts, which feature a very visually different population, one composed primarily of darker-skinned, poorer individuals. In the case of Soltan, the image event offered individuals an opportunity to become involved in image production and display activities. Political art and expression became democratized through these activities, with artists and consumers overlapping to the point of becoming indistinguishable. This is in keeping with portrayals of Soltan that use a simple declaration of her name as a signifier of greater political meaning, often being used as profile images that align the users with Soltan as all victims of the violence. The various meanings of the Soltan image event are consistently malleable and regularly remade by the often anonymous image reproducers in the public realm. Soltan is thus of the people and made purely by the people, her meaning far from set in stone. In the wake of the event, voices showcased in the media discussed her significance and the ideology fueling the movement in terms of already established figures of the state. Babak Rahimi, an assistant professor of Iranian and Islamic studies at UC San Diego, wrote in the New York Times that “the brutal death of Neda Agha-Soltan … has generated a counter-discourse on the practice of martyrdom in a country known for its long tradition of reverence for martyrs and heroes. As a young woman and a student, Neda has emerged to signify a new symbol of martyrdom that is less about the story of a fallen martyr and more about an all-inclusive experience of self-sacrifice.” He states that this act of martyrdom, invited or not, generates a kind of equality among the sexes that further fuels the desire of civil rights. “‘I wish I was Neda,’ a young Iranian man utters in remorse. This statement reveals how death at the face of tyranny is ultimately gender-free. In Neda, both men and women can realize the ultimate act of sacrifice for a noble cause. Neda has also come to represent the sorrows of so many young Iranian women, who suffer under the crushing legal apparatus of a regime that has denied their basic civil rights” (Rahimi 2009). Hamid Dabashi, a professor of Iranian studies and comparative literature at Columbia University, perceived the movement as a civil rights movement but one that sanctioned the continuity of the Islamic state and one that still poured its hopes into the waiting vessel of Mousavi. “These young Iranians are not out in the streets seeking to topple the regime for they lack any military wherewithal to do so, and they are alien to any militant ideology that may push them in that direction. It seems to me that these brave young men and women have picked up their hand-held cameras to shoot those shaky shots, looking in their streets and alleys for their Martin Luther King. They are well aware of Mir Hossein Moussavi’s flaws, past and present. But like the color of green, the very figure of Moussavi has become, it seems to me, a collective construction of their desires for a peaceful, nonviolent attainment of civil and women’s rights” (Dabashi 2009). But as time has passed since the initial violence, the protests have evolved into a different beast. This goes back to Mousavi’s and other leaders’ historical political lineage, intimately bound up in the Islamic republic as Dabashi acknowledges. Mehdi Khalaji writes in Foreign Policy that “despite being lauded as modernizers, opposition front-runner Mousavi and his two green movement colleagues are deeply loyal to the ideals of Ayatollah Rouhollah Khomeini, the founder of the Islamic Republic, and advocate a theocratic political system” (2009). Meanwhile, the green movement participants who remain the key drivers of the street and online protests, are “motivated by the notion of human rights and citizenship” – features, Khalaji points out, that are missing from Iran’s Constitution (2009). So who, if not the moderate figureheads who ran against President Mahmoud Ahmadinejad and lost, is organizing the revolution? Khalaji writes that it is “bloggers and leaders of human rights and women's movements,” a statement supported by others writing about the movement. Even Mousavi is cognizant of the reversal in leadership. In one article published in the Financial Times, one of Mousavi’s aides says of Mousavi’s perception, “[Mousavi] says this movement has no head and it is him who follows the people not the other way round” (Bozorgmehr 2010). At the end of 2009, Andrew Sullivan of The Atlantic again demonstrates the power of imagery to convey shifts in power in a way that shapes media framing of the struggle in a post entitled “One Simple Thing.” He displays a YouTube video of a recent demonstration and points out that “in many photographs and videos in June, when the regime first cracked down, many of the people on the streets were wearing face-masks or bandanas to hide their identities for fear of the consequences. Today, it was the baseej [the paramilitary volunteer militia founded by the order of the Ayatollah Khomeini] who were wearing the masks and bandanas” (2009). Fear of exposure and targeting for violence, as Sullivan highlights, is the main impetus for disguises, and the event demonstrates that by the end of the year, the balance of power had shifted to the demonstrators. Another major factor in sustaining the Iranian election protests is how its participants have used social network tools to circumvent state controls, again empowering the individual at the expense of traditional state controls. As Jon Leyne writes for BBC News, “Iran's post-election protests showed the world the power of new media to organise and publicise opposition in a controlled society” (2010). Social network tools have emerged as endowed with both the ability to organize and sustain protests to a greater degree than traditional forms of communication, and also as an opportunity for subversion and performance activities that align users with the revolutionary goals and community. And in a recent development that follows quite logically from the evolution of the online network’s role in sustaining the protests, the government has taken to verbally and literally attacking Twitter in an attempt to shut down the organizing channel. Twitter offers more than one fascinating example of users subverting the network’s tools to social effect, causing its statistics can go awry on purpose. Plenty of services take information from Twitter profile pages and aggregate or analyze the text-based data to paint portraits of the network in real-time. But during the Iranian protests, while Twitter was being touted for its role in connecting protesters and mobilizing them to rally points, users found a salient reason to make the widely accessible information inaccurate. A campaign inspired the global community to help as they could by hiding protesters in virtual plain sight: many Twitter users changed their location to Tehran to make it more difficult for Iranian government officials to track protesters. In fact, one reporter decried how this move would make gauging Twitter’s impact on the protests accurately a much more difficult task, perhaps not the noblest of sentiments but accurate nonetheless (Morozov 2009). This is an excellent example of how Twitter users repurposed an already available functionality to have a desired effect, but still hewing close to the meaning of the original action. In another move that innovated on an existing feature and signaled a shift in meaning behind the use, many Twitter users as well as those using Facebook and other networks, overlaid their profile pictures with a green shade to indicate solidarity with and support for the protests in Iran, called the Green Revolution. Arik Fraimovich created the Twitter application, which builds on an existing function to add meaning to it, a performative act of adding political meaning to an image that is already endowed with one type of meaning, adding a dimension to self-identity. While difficult to track with analytic engines, the visual signifiers presented another subversion of use to mobilize the global community in support of a national movement, but in this case innovating at the edges of an already existing function. There are already cracks in the new model of social change seen here. In May of this year, Robert Worth wrote about the leadership vacuum that has hampered the success of the protests. Despite the best efforts of Mousavi and other elders associated with the mass movement, “their ability to organize protests has proven limited, and their credibility is low among many younger protesters who regard them as insufficiently aggressive” (Worth 2010). According to Worth, the main factors working against the movement today are the decentralized leadership and the “reliance on exiles who work through the Internet” – in other words, the very qualities that broke through the state structures of control last June (2010). So what then is the true value of the powerful image production and virtual organizing capabilities of the Green Revolution? How far can individual participation in collective action take a movement, and is it only civil rights movements that can gain traction against the state? The endgame initiated by the Iranian election protests has yet to reach a checkmate, but as we’ve seen, the tide may be turning in favor of the protestors but may also be losing vital momentum without decisive leaders and clear objectives. And while the Iranian diaspora has been able to build a global support network that sustains the passion of the national demonstrators, the possibly out-of-touch diaspora community may not always make the best decisions on behalf of the local people. There are indications that online advocacy movements will only grow stronger as they refine their techniques and activities, but nevertheless, it is clear that strong and popular political leadership that can make a smooth transition is an absolute must for the Iranian election protests to end in success. Several pieces of writing talk about their search for a Martin Luther King, Jr., and it appears that Mir-Hossein Mousavi does not possess the right background or current goals. Perhaps a strong woman who can take the passion and fervour of the Neda Agha-Soltan image event and transform it into a strong policy platform is what is missing.